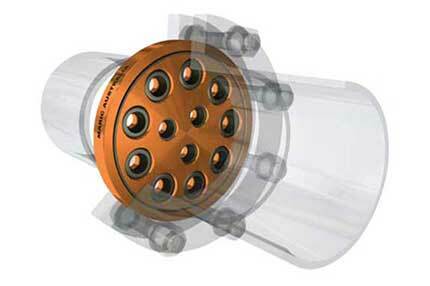 “Wafer type” valves, is the term Maric gives to the flow control valves intended for flange mounting. Maric Flow Control Valves are available in wafer types to suit a wide range of flange specifications i.e. Australian, American ANSI, British BS, and numerous other specifications. Why choose wafer type valves ? Wafer type valves are the obvious choice for larger size valves, however Maric do offer them in sizes down to DN 20. Wafer type are more easily removed in larger installations than threaded valves, because there’s no need to rotate the pipes for disassembly. A wafer can be quickly removed and refitted by loosening all bolts – and removing one completely, and slipping the wafer out. Maric wafer type flow control valves incorporate an o’ring fitted into each face, for sealing purposes. These are ideally suited to smooth faced flanges. Rough faced or cast flanges may require the use of flange gaskets. A smear of grease in the o’ring groove will prevent the o’ring falling out during installation. Maric wafer type valves are orifice plate style i.e. they do not extend to the “full flange” outside diameter (per image shown).